Thanks everyone for posting their favorite local store. I'm happy to say that I have even been to some of the them. 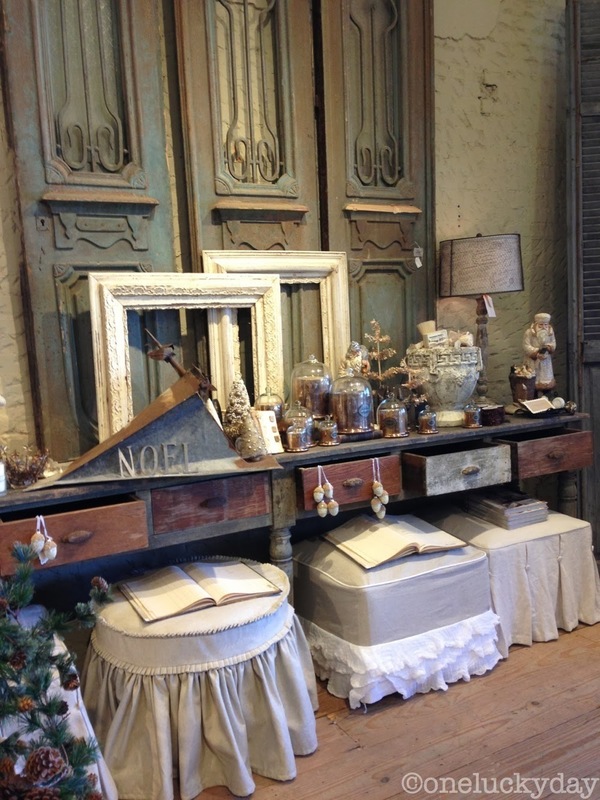 One of the stores mentioned in the comments was Patina Green which segues nicely into today's post on McKinney, TX. 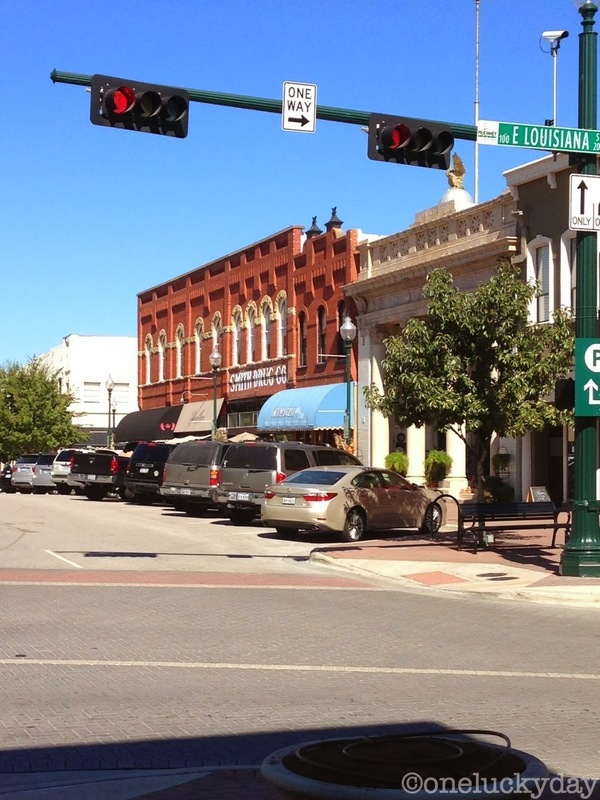 I have have been to McKinney once before and knew what a fun place it was, so last Wednesday morning my sister and I headed out for another adventure. McKinney is across the metroplex from my sisters home. We were getting close to our exit, when my sister looked in her rear view mirror and said to me, "don't look now, but we are being followed by a hotdog". What? a hotdog? When I turned around I saw what she meant and then we both burst into laughter. The kind where tears are coming out and you can't catch a breath. I was trying to get a picture but the darn thing was going so fast that I just started snapping and hoped for the best. Of course the laughing did not help since I couldn't hold my phone still. Bye hot dog car! Till we meet again! After all that, we missed the exit and had to loop back around but it was worth the detour to get a good picture. Once into town we found a parking place between Louisiana and Virginia streets right on the main square. 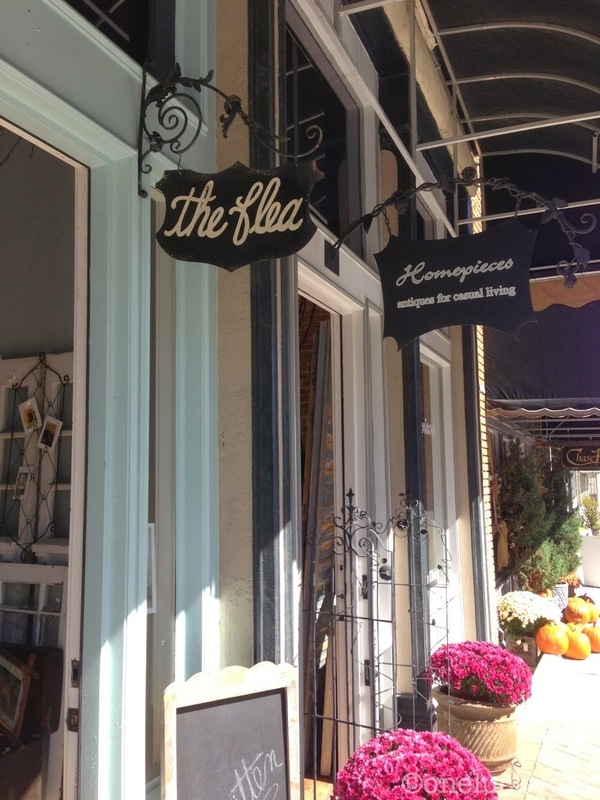 I love how the old buildings have been converted to stores and restaurants but the old signage remains. We headed for Virginia st. since that is where all my favorite stores are. A quick stop into The Flea for some vintage glitter then on to Homepieces for a look around. Down at the end of the street is the Antique Company Mall which is a favorite. Some of the booths I loved the first time around are not there anymore but there was still plenty to choose from. 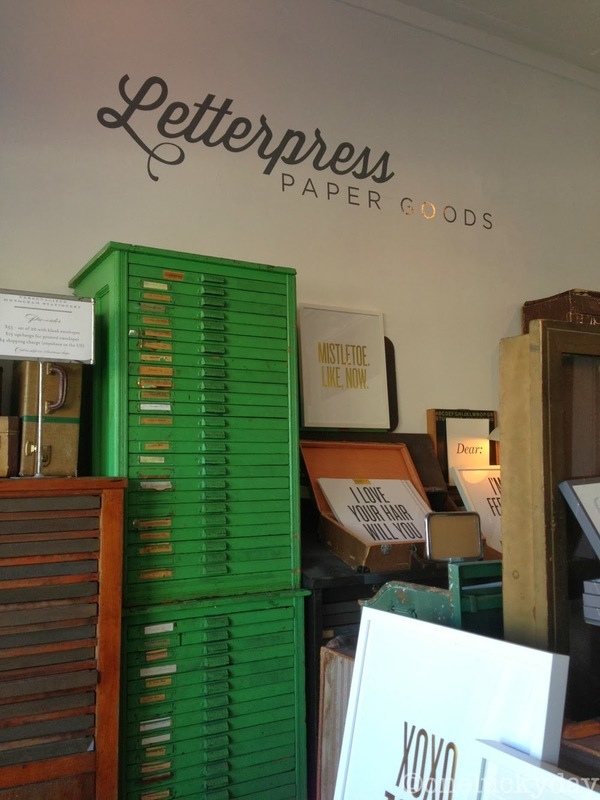 Then across the street to Letterpress Paper Goods. 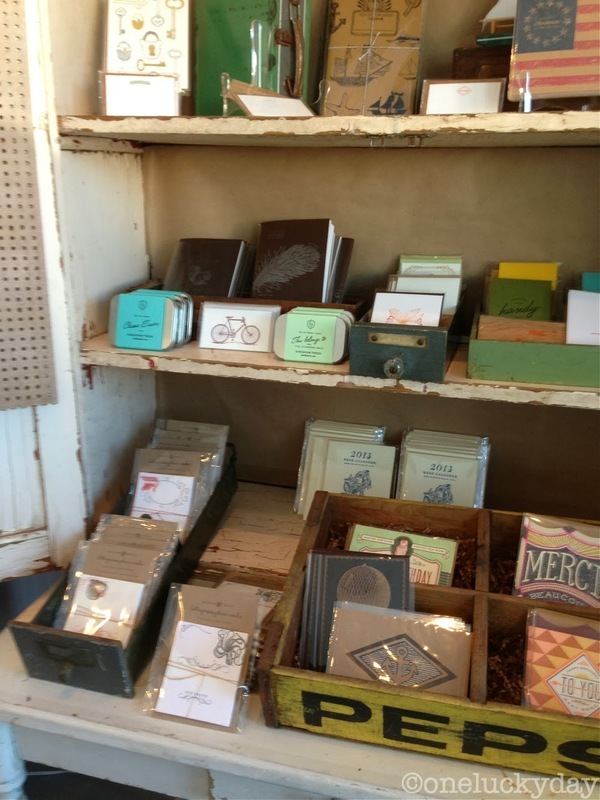 Jason McDaniel, the owner of Missing Q Press was in class the previous Saturday to make the Gilded Christmas Box and mentioned he had a shop in McKinney. What fun to be able to see inside. He even showed us around the backroom where all the presses are and explained how he used each one. Of course I loved all the vintage type drawers and suitcases. 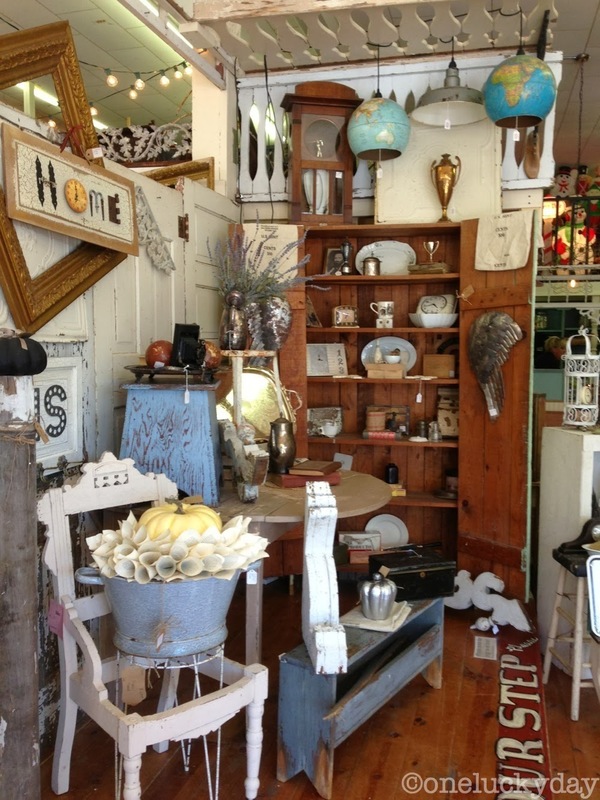 These pictures do not do the small shop justice. I found this super short video on the Missing Q Press Facebook page that shows the parts of the letterpress process. I thought you might like to see how the vintage presses at work. Missing Q Press from Sandy Mozur on Vimeo. 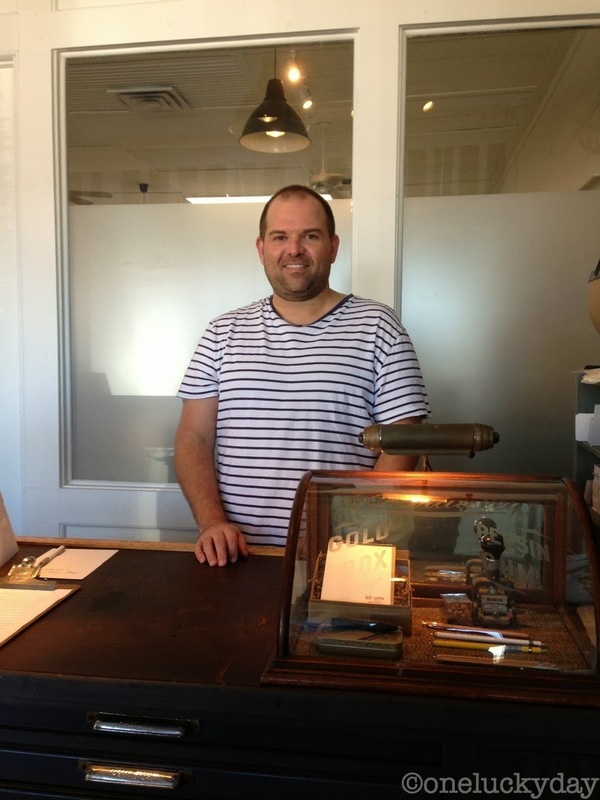 Here's Jason behind the counter at his shop. Do you not love that little glass case with the etched curved glass on the counter? We had a discussion about how wonderful it is to be looking for something for a long time and then suddenly come upon it (and at a reasonable price). Thank You Jason for the tour of your shop and your kind demeanor. I am glad we stopped in to say Hello! 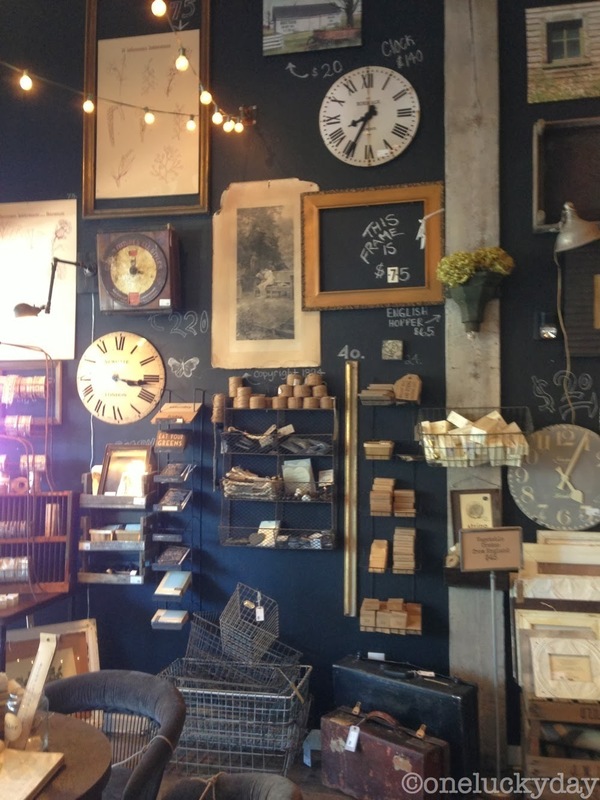 Next door to Jason is a stunning shop appropriately called My Favorite Room. 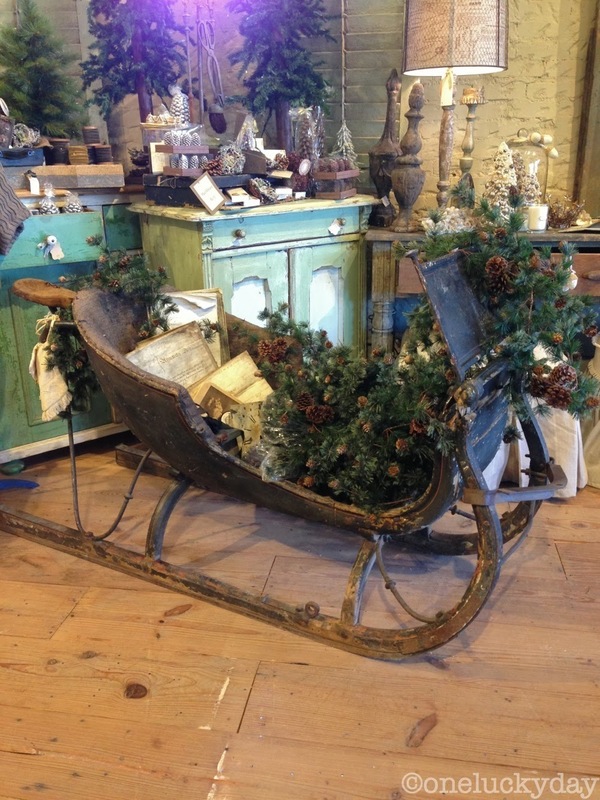 I have never seen a sleigh for one! It was still covered in the original fabric. 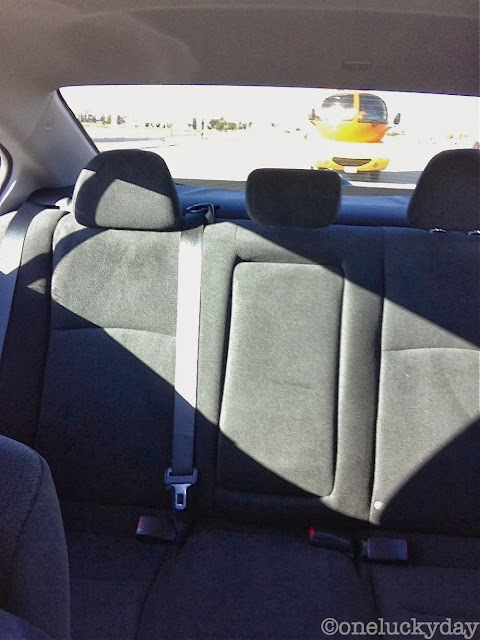 Notice the very small (seriously child size) fur covered seat at the back? I am guessing the driver would sit there to hold the reins and steer the sleigh. 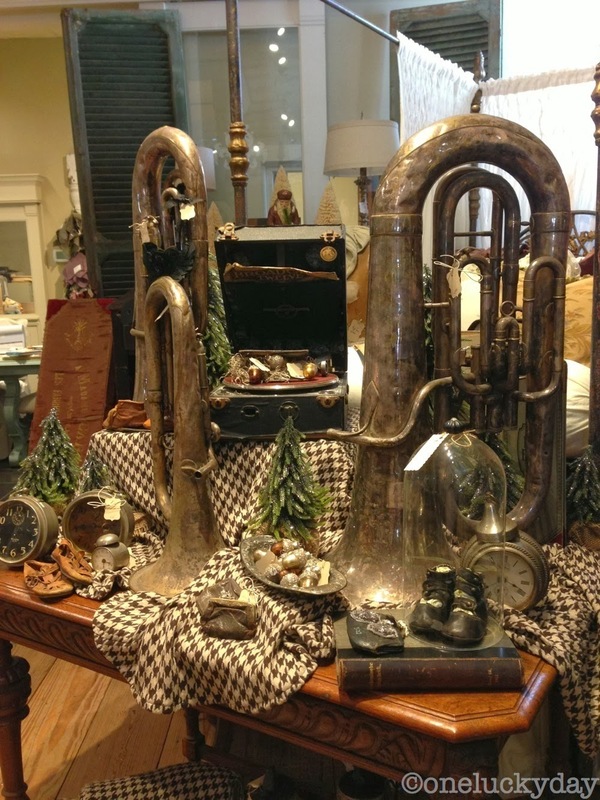 What a wonderful piece. 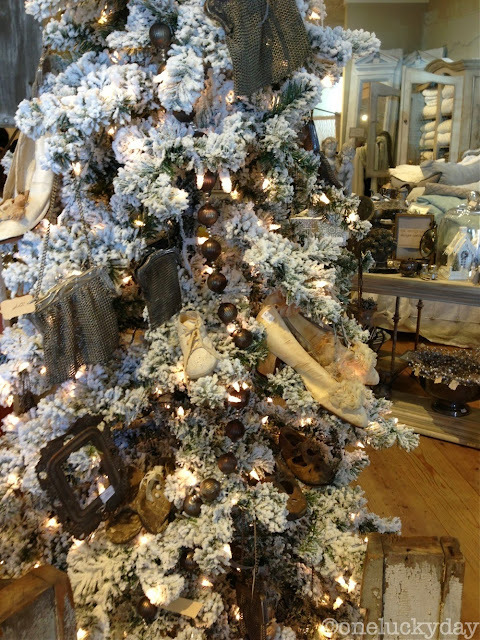 All the trees were decorated with unique items...this one had vintage metal purses and old cream colored shoes. 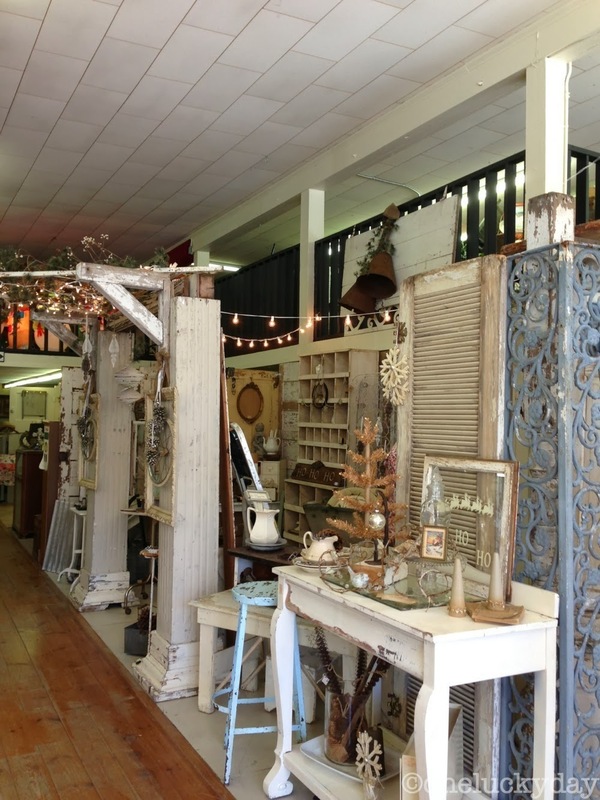 My Favorite room was eye candy at every turn. Just fabulous. 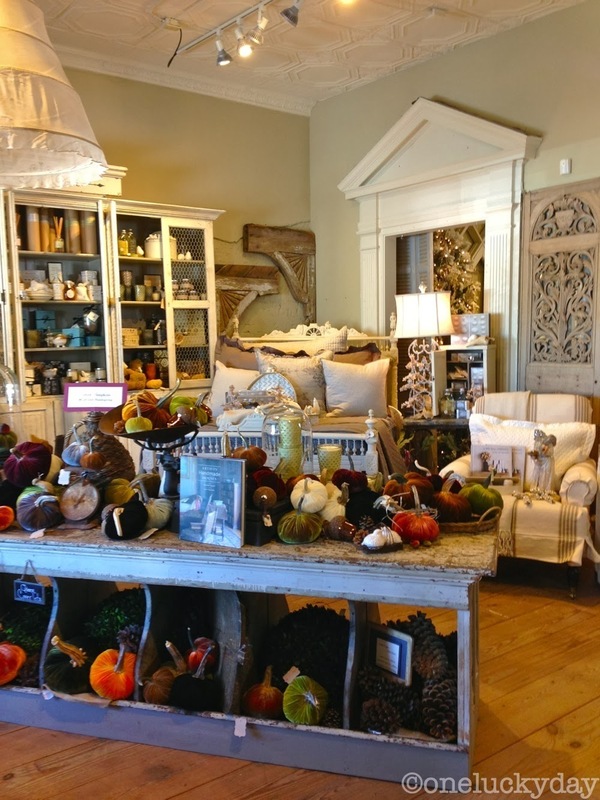 Now up the street and around the corner onto Tennessee to Patina Green Home and Market, our favorite place to have lunch. I will admit, much of this store has turned into food goods like bottled jars of jam and vegetables (not in the same jar though) but it was no less beautiful. 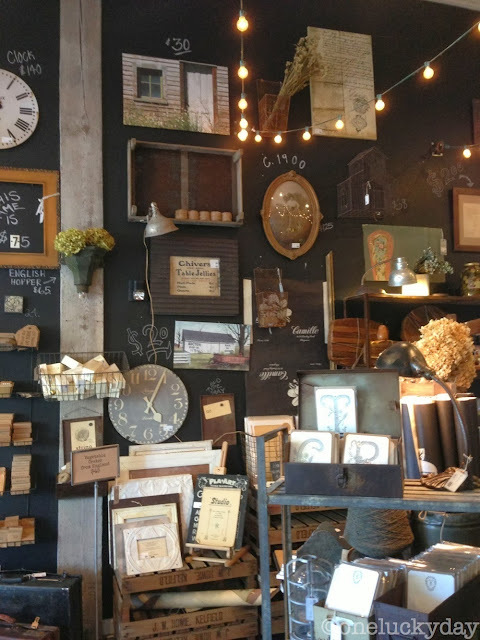 The front of the shop has some fun displays that incorporate a huge chalkboard wall that was hard to take your eyes off of. I love how the wire birdcage was screwed directly to the wall. 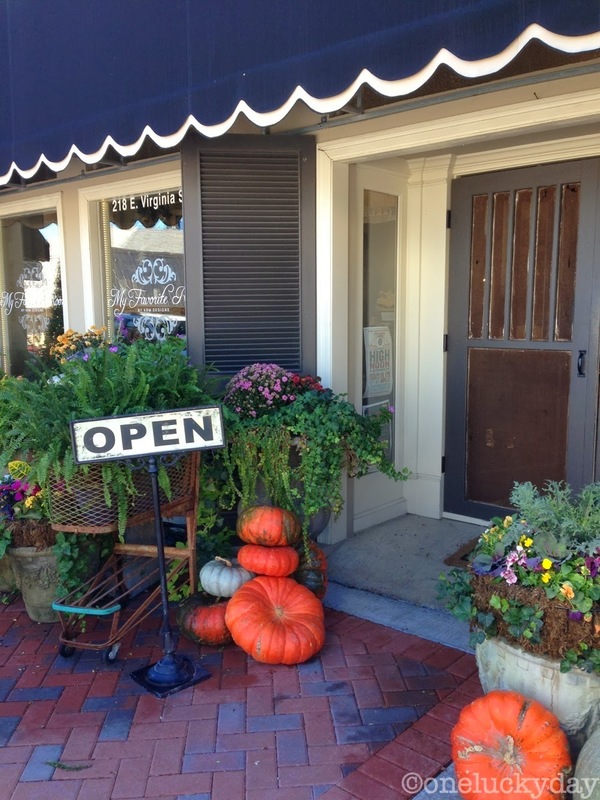 Patina Green is a farm to table establishment where the menu changes depending on the season and availability. Of course we had lunch! 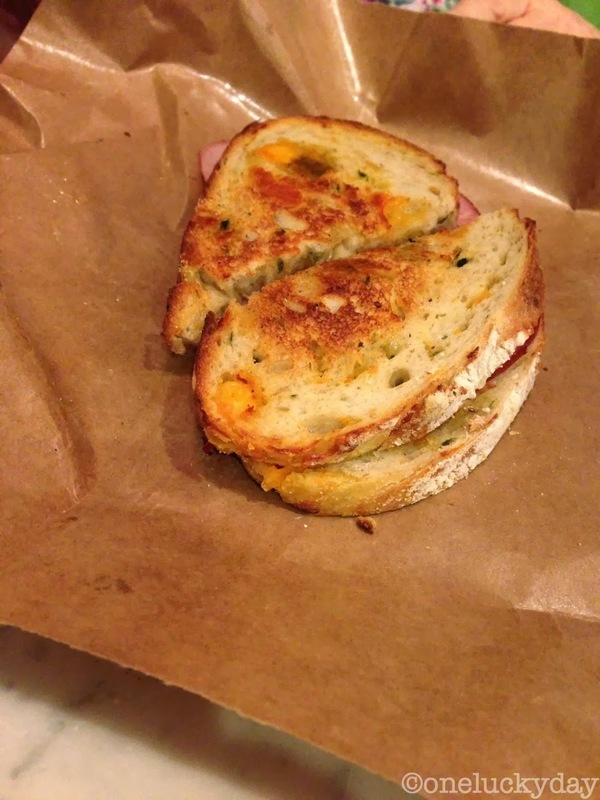 Today's sandwich was ham with smoked cheddar cheese, jalapeno peach jam on jalapeno cheddar loaf. Wow, was it good! After lunch we walked around the rest of the square. 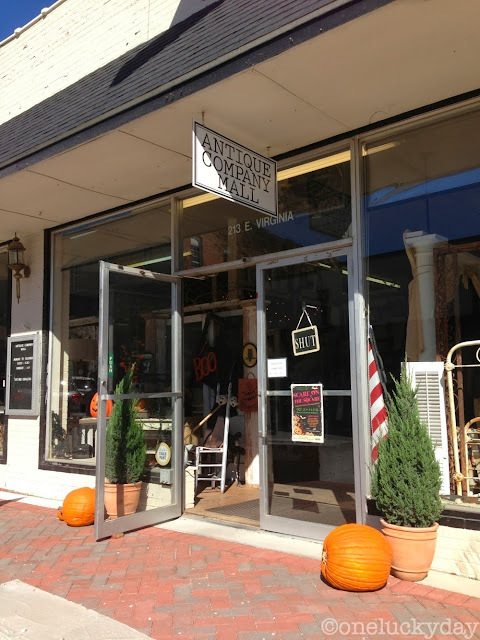 I picked up a few things at another small antique store...lost a few things (yardsticks I bought in the first store were left somewhere and I didn't notice till we were back home, darn it). One of my favorite purchases of the day was this $16 group photo to add to my collection. I LOVE when the photo has information written on it. 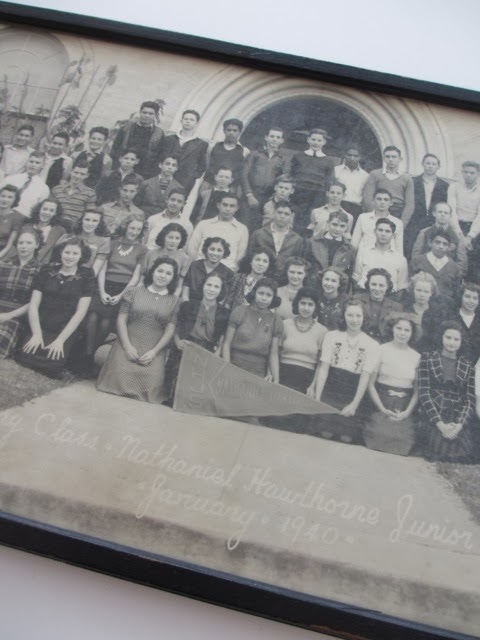 This one is from Nathaniel Hawthorne Jr High School. The photo was taken January 1940. I said in the last post I would give some goods away if you told me your favorite store. Here are the goods and here is the winner! Thanks to all who commented. Cheryl C - please email your shipping address to me at paula@oneluckyday.net and I will get the goods out to you! 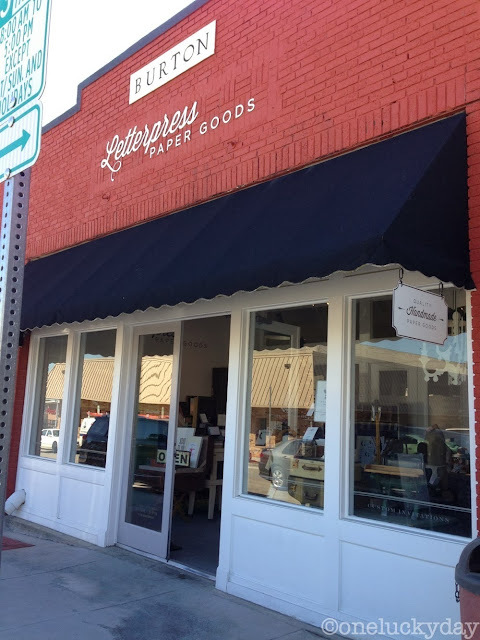 I will be back on Friday with my Houston Quilt Market report...oh, and maybe another giveaway...because you know I couldn't come home empty handed! I just loved all these pictures and the sled - I would love that sled - it is perfect (don't let Tim see it he will want it!) 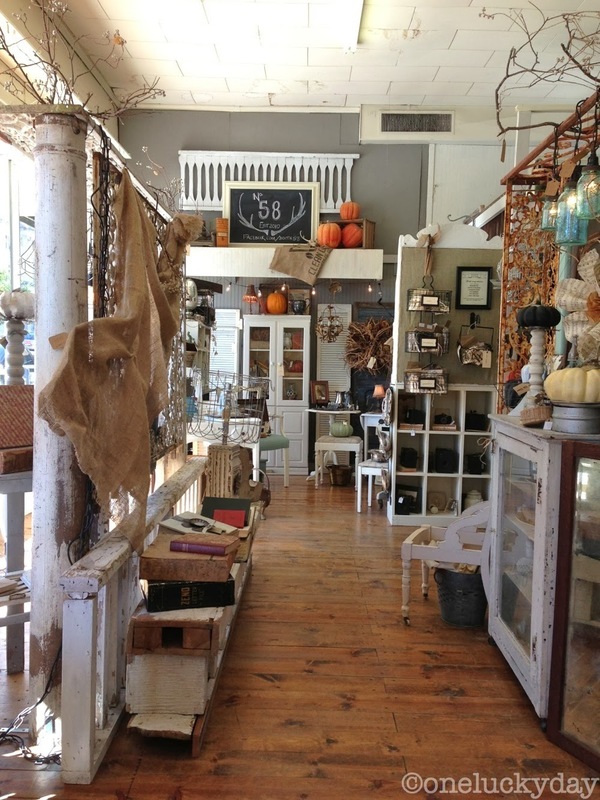 I wish I had some cool stores like these around where I live - but I bet my husband is glad that we don't!!! Kat I thought the same thing! Although there is no more summer show so now I have no idea what we are going to do with the sleigh! The next time I'm in Texas, I have a definite destination! Thanks for all these "swoon-able" pictures! And so many thanks for me being chosen from your many admirers for the give-away! thanks so much! I will see if I can find someone to pick them up for me! Congratulations, Cheryl C!!! Lucky Girl! 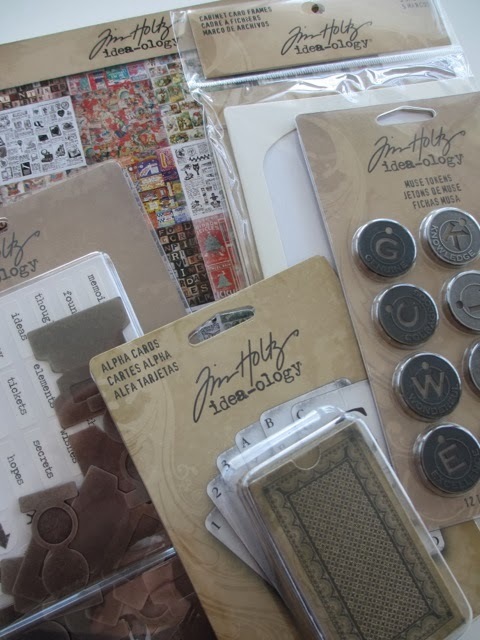 Look at all those Tim Holtz goodies :) Paula, I can't believe I've never been to McKinney. I've heard how wonderful all the stores are and now looking at all the fabulous photos of your field trip, I have to go! Thanks for sharing your fun filled day....maybe someone will see your post about the misplaced yardsticks and return them. Have a beautiful day! I see that someone indeed found your yardsticks and are saving them for you. Love it when there's a happy ending! I would be more than happy to pick them up for you and ship them. Congrats to Cheryl on her win! 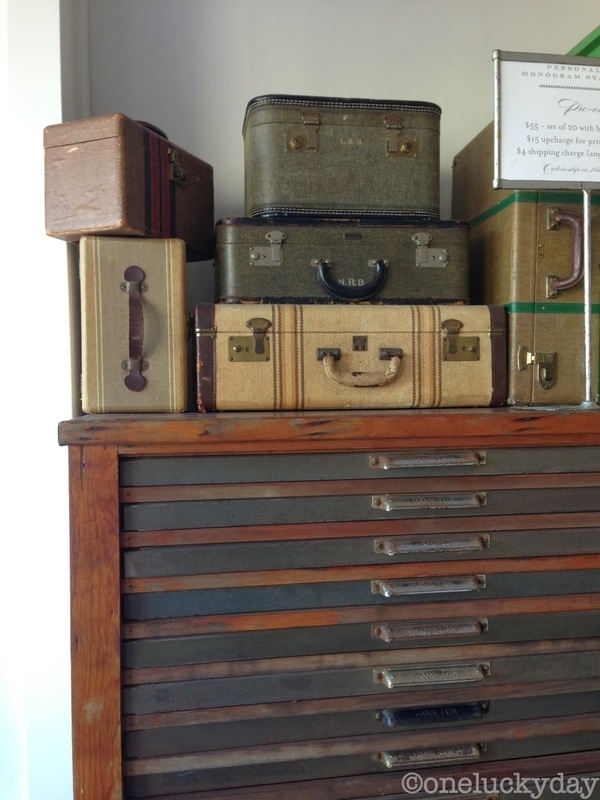 So glad Patina Green Home and Market found your yardsticks so they can be returned to you. i want to wander through those shops! Oh my goodness! Every one of those stores looks simply magical. I'm checking now to see how far McKinney is from my sister's house. I HAVE to go there! Thanks for sharing Paula. 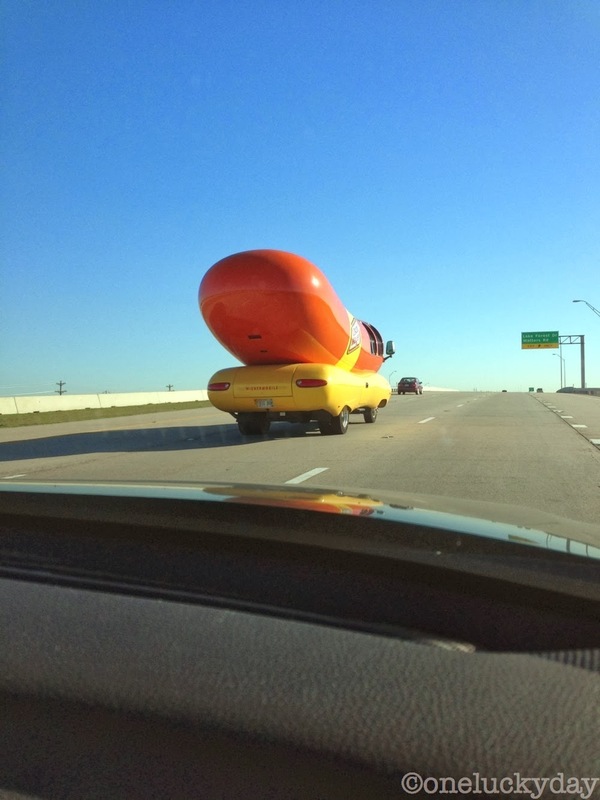 that is a bit of a drive Heidi but maybe you will see the hot dog car too! Oh, I'd love to be an Oscar Mayer wiener. 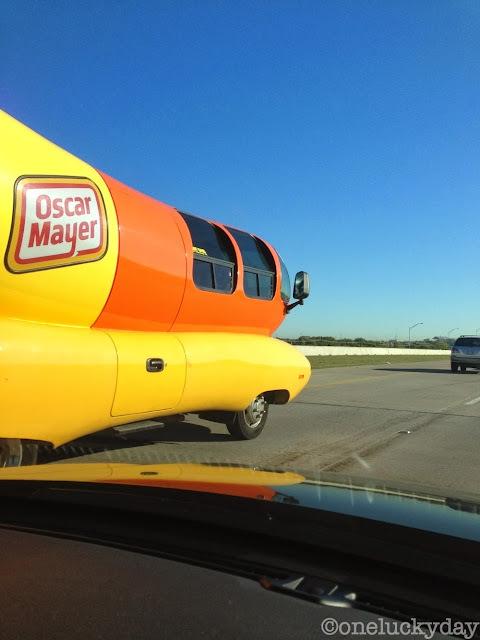 Oh, I'm glad I'm not an Oscar Mayer wiener. Good times and now I hope the song isn't stuck in your head. Love the pictures of the shops, spotted some things I would love to take a closer look at. Maybe someday I can catch a ride in the wiernermobile and head down to Texas. thanks for sharing your fun story Peggy! And I might just be singing that song in my head already! Paula, it was so great to see Jason, my tablemate highlighted in your story. We are headed to Canton tomorrow for first Monday. I'm trying to add a detour to Mckinney after seeing your blog. But for today... I'll head out to feed my chickens singing... OH I'd love to be an Oscar Meyer weiner! Hi Eloise! I wish I was going to Canton with you! Love that place! Paula, I am so glad that you will be getting your yardsticks. I can't help but wonder how that wonderful sleigh got to Texas. Another favorite is the tree with shoes. I just love it when you travel to these neat places! I love McKinney so much. I remember the first time I went to Patina Green, I stayed in that bathroom for about 45min. People must have thought I have' internal issues' but I was just trying to get good pictures of that amazing sink! lisa, I have the pictures to prove it that I also spent some time in the bathroom at Patina Green! It's amazing!